This position correcting CNC Router allows you to follow a rough outline of a part on the small screen and tool auto-corrects to the detailed pattern line. The tool is attached to a hand held frame. Actuators within the frame can move the tool to compensate for errors you would make when trying to cut a complex shape. A high contrast pattern is placed on the work piece. They are the horizontal bands of shapes in the image above. The tool creates an internal map of the work piece using a camera. 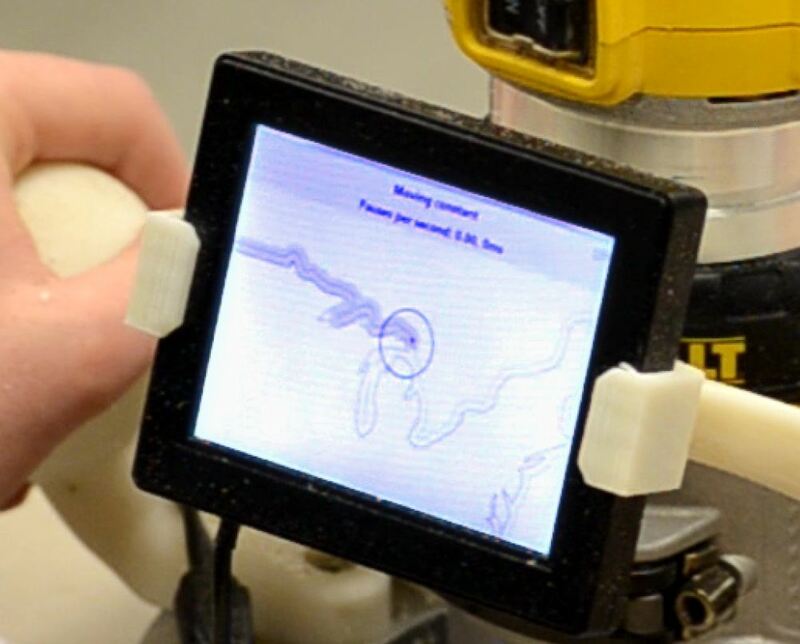 It can then accurately determine it’s location anywhere on the work piece without the drift that might occur using incremental positioning sensors. The outline of the cut to be made is shown on the screen. The location of the tool center is also shown on the screen. You only need to follow the line within the correction limits of the tool. The tool digitally corrects to produce remarkably good results. This video accompanies the SIGGRAPH 2012 paper Position-Correcting Tools for 2D Digital Fabrication, by Alec Rivers, Ilan E. Moyer and Fredo Durand. The paper is available here: http://groups.csail.mit.edu/graphics/positioncorrectingtools/ That site also includes a mailing list where you can sign up to stay informed about a forthcoming commercial version of the position-correcting router.